Presidents, like normal people, tend to seek in others what they admire about themselves. Which brings us to the par-5 12th hole at Woodlawn golf course in Fort Belvoir, Va., on Father’s Day. Vice President Joe Biden, an 8 handicap, has leaked a 3-wood into the trees near the green. He stands amid the underbrush, talking with his match-play teammate, the President of the United States. Since Dwight Eisenhower evicted the South Lawn squirrels tearing up his putting green, every President but Jimmy Carter has been a golfer. John Kennedy was known for low scores and a graceful swing. Ronald Reagan, whose scores were a state secret, putted down the aisle of Air Force One. Bill Clinton established a reputation for fudging his score  cheating, some said  in rounds with campaign donors while chewing an unlit cigar on the tee. George W. Bush played the way his father H.W. did, like a race against time, until the last years in office, when the son banned himself from the game because he didn’t want to send the “wrong signal” to the mothers of the Iraq-war dead. 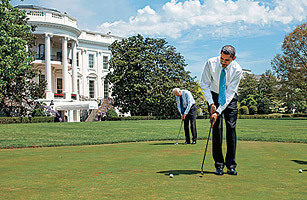 Obama, who took up golf in his mid-30s as a relaxing alternative to basketball, did not find much time to play during the campaign. But now that his game is out of the closet, it is clear that he duffs in much the same way that he tries to govern. “You can really tell a person’s personality by the way he plays golf,” says Wellington Wilson, a longtime golf buddy. “He just goes with the flow. Not too high. Not too low.” Whereas Clinton was known to shout, curse and rehit balls until he liked his shot, Obama never cuts a corner in golf, say his companions. No mulligans. No five-foot gimme putts on the green. “I’ve never seen him get to the point where he just picks up,” says Marvin Nicholson, the White House trip director and a regular partner. “I’ve seen him write a 10 down. I’ve seen him write an 11 down.” But that doesn’t mean the President always behaves like a gentleman. As in basketball, Obama is a trash-talk enthusiast who tries to get into the heads of his opponents and sucker them into taking more difficult shots. “He is very strategic about his use of it,” says Eugene Kang, the 25-year-old White House special-projects coordinator, who played with the President at Andrews Air Force Base in late June. “It’s always fun to make the putt and give him a nice little look at the end.” The jawing can get especially fierce when the opponent is press secretary Robert Gibbs, with whom Obama shares some golfing characteristics. “His game is severely handicapped, as is mine,” Gibbs says. Most of the President’s longtime golfing buddies say the First Game is improving. After a brief flirtation with a new Nike driver, Obama has returned to his Titleist and is still struggling to master his new hybrid woods. He putts solidly and is working on his bunker shots, once an Achilles’ heel. The President keeps the game in perspective. Most days Obama does not win or lose more than a few dollars. The Father’s Day outing ended with Biden and Obama each collecting $2, though Biden paid for the hot dogs after the front nine. Wilson, who has been playing with Obama since 1999, keeps all his Obama winnings in an envelope, which he has promised as a college fund for Sasha and Malia. As of early July, the envelope contained $2.25. Watch Tiger Woods play Wii Golf.